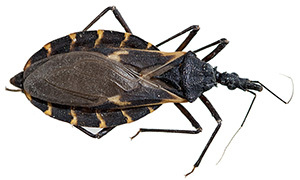 Chagas disease, also known as American trypanosomiasis, is a parasitic disease that is spread mostly by insects known as Triatominae or kissing bugs. A Kissing Bug can be recognized by its cone-shaped head, thin antennae and thin legs. Each species found in the U.S. is mainly black or very dark brown, with red, orange or yellow stripes on the edge of their backs. Chagas disease is mainly transmitted to humans through the infected feces of the kissing bug. The bug usually bites an exposed area of the body, such as the face -- hence the name, "kissing bug." After its blood meal, it defecates close to the bite area. The parasite in the feces is then transmitted when the person instinctively scratches the area of the bite, thereby putting the feces in contact with the exposed bite. 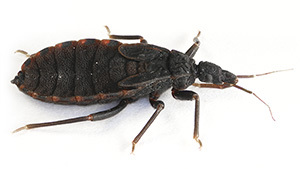 According to the World Health Organization, contracting the Chagas disease has two phases: an acute and chronic phase. Depending on cardiac damage caused by the disease, the mortality rate in a period of 10 years ranges from nine to 85 percent. Patients usually die by frequency order, sudden death caused by arrhythmias, heart failure and vascular cerebral accident. The acute phase lasts for two months after the infection and in most cases, symptoms are not evident, or are mild. Some symptoms include fever, headache, enlarged lymph glands, pallor, muscle pain, cough, difficulty in breathing, liver enlargement, generalized body swelling, diarrhea, heart inflammation (chest pain or heart failure) and rarely, meningoencephalitis (with seizures and paralysis). In less than 50 percent of people bitten by triatomine bugs, a first visible sign can be a skin lesion or purplish swelling of the lids of one eye. The most frequent form of Chagas is the chronic phase, which is lifelong. In most patients there are no signs of disease and it is found after the acute phase. In another form, up to a third of patients' hearts are affected causing arrhythmia, heart muscle disorder, heart failure and embolisms. They are mainly active at dusk or at night and their bites do not hurt. The bug should be handled with a glove or small plastic bag because it can be infected with the T. cruzi parasite that causes Chagas. It can be stored in a plastic bag, in a vial or small container. Any surface touched by the bug should be cleaned.